When a film stays with me long after the final credits it is usually a sign that it’s a very good one. Meek’s Cutoff gave me that experience. A spare story – a realistic observation of a time in the pioneering history of America. Kelly Reichardt’s film tells the story of three families travailing across the ardous Oregon trail in search of a new life, guided by a braggart of dubious credentials, a shaggy bearded man called Meek (Bruce Greenwood – excellent), he advises a shortcut off the main stem trail that leads them to doubt his choice and face the possibility of dying for their dream. 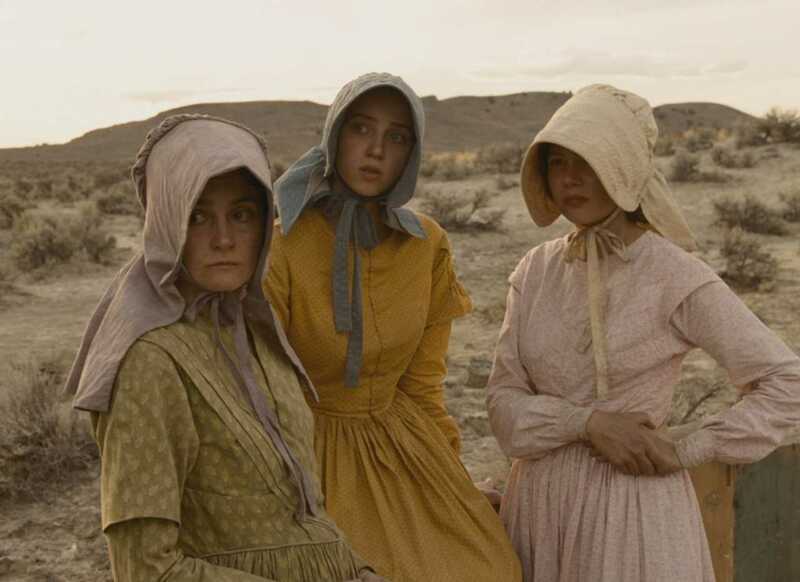 The film begins with the striking image of 3 women, one by one crossing a deep river, drenching their shabby calico frocks, heads covered by simple bonnets. It is a slow poetic sequence and sets the tone for much of the films deliberate pace. Often the landscape is filmed in wideshots with the human inhabitants and their covered wagons plodding along, wheels creaking. A mere blot in a vast land. Once the doubt sets in towards their guide, it is the men who step aside to discuss what to do, with the “womenfolk” eavesdropping for a hint of what is going on. These scenes are filmed with the women in foreground and the men at a distance, establishing that the story may have a feminist point of view. Reinhardt does not push this aspect but it is apparent and thankfully subtle in approach. At the forefront of the group of wives is Emily Thetherow played superbly by Michelle Williams (her second collaboration with the director after the wonderful and spare Wendy & Lucy). She has no time for Meek and his stories of bear hunts and Indian killing sprees. It is an Indian who provides a turning point to the story, along the way they capture a lone native (Ron Rondeaux) and much to the protestations of Meek they decide to follow his lead, hoping he will lead them to a water supply to save them from death. What I loved about this part of the movie is that the Indian speaks his language (without subtitles) and they speak theirs so neither knows what is being said – he does seem a better option than the craggy Meek. The film has no action sequences to speak of which is what one would expect of the usual wagon-trail saga. When a disaster does occur it is accepted and the story continues on its way to a conclusion that lets you decide the outcome. Reichardt has cast the movie with excellent actors who fill the roles to perfection. Paul Dano & Zoe Kazan play the young couple of the group, Will Patton is William’s husband Solomon, and the last family of 3 are played by Neil Huff , Tommy Jensen and the superb English actress Shirley Henderson (Wonderland, Harry Potter). Reeking of period authenticity from the costumes to the make-up, hair and production design (yes there is design in wagon trains and household possessions!) it takes you into the world of hardship that must have been. The dry arid landscape is superbly captured by cinematographer Chris Blauvelt. Go with the pace of the film and you will be rewarded by its simple pleasures. 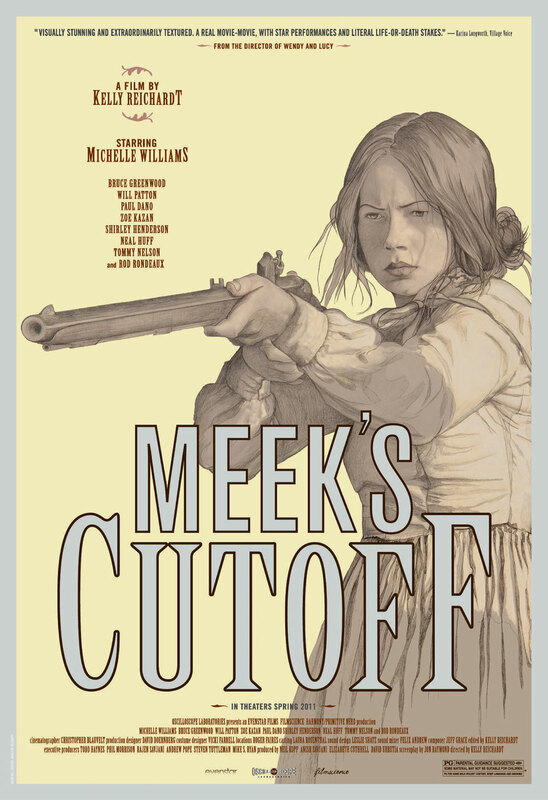 * Meek’s Cutoff is screening at ACMI in Melbourne till June 19 as part of a Kelly Reichardt spotlight. It is also screening at the Sydney Film Festival on Sunday 19 June – 3pm at the State Theatre. Unsure if it is to gain a commercial release.